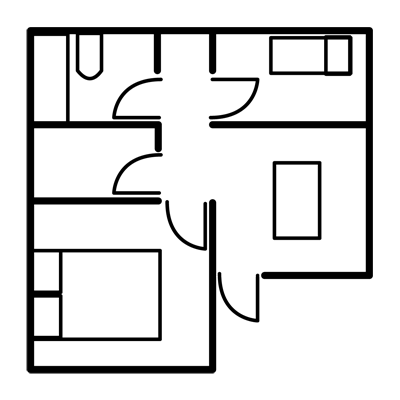 Distribution plans which show the different living spaces or rooms such as bedrooms, living areas, hallways, kitchens, bathrooms, garages etc. and building elements such as inner and outer wall thickness, doors, windows, sanitation facilities, etc. Elevation plans which show different building façades and height and singular elements on roofs, doors, windows, balconies, chimneys, slopes on the terrain, etc. Section plans which show a cross section of a building at its varying floor heights, staircases, lift shafts, support heights, slab thickness, framework, false ceilings, etc. These plans are to discover the state of a property and are widely used in renovations, valuations, demolition and remodelling projects.